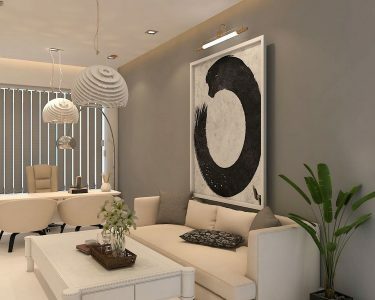 This 800 square feet small office has a mood of luxurious with modern lines, where all functions can be found. The goal was to keep the sunny, spacious and stylish feel. The first step was to define the functional areas – the owner’s office, a waiting room, kitchen and washroom. The boundaries of these zones were divided by the wooden partition walls, another starting point was the high window from the floor up till the ceiling, providing plenty of natural light. The Interior designerin this small office has taken full advantage of the natural light in large windows, the clear, neutral, natural color palette showing an open, comfortable space. It is challenging to create a complete work space in such an area with all the features, but here it is skillfully elegantly implemented. The basic tools of decoration are natural wood, décor plaster and concrete textured paint. 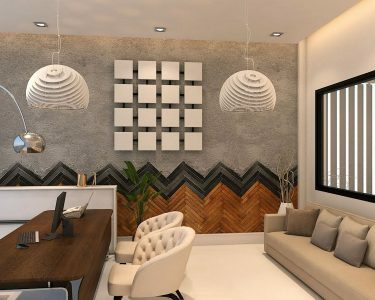 the herringbone textured natural wood tiles rising four feet up on the wall. 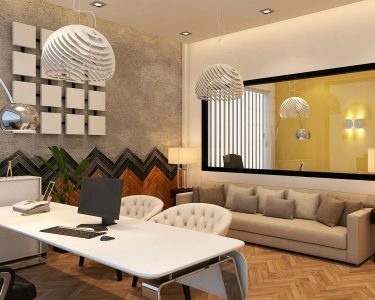 The furniture also contributes to the different zones of office with a lower comfortable sofa, leather chairs and stainless-steel table with highly glossed wooden table top in white, completely separated from the rest of the furniture. The kitchen is well organized and well equipped. Ability to dwell in is the abundant natural light, which further emphasizes the contrast of different material qualities. Thus, it became the basic idea of the design that the character’s pattern matte surface of the floor collides with the high-gloss white masses and their non-texture, highlighting their peculiarities. The color palette was rather limited, and design would require great deal of self-discipline: the colors appear only on the walls in the outside waiting area, but there is a loud and pronounced look. The basic equipment includes built-in enclosures and almost invisible storage compartments making the office even more comfortable. The end result was a friendly habitable environment.